For better or worse, the Internal Revenue Service has always maintained a reputation as a black cloud that hangs over us – a Big Brother watching our every financial move. Ask most people what they fear most about filing their taxes and they’ll likely tell you that an audit from the IRS is number one on their list. While in truth only a small number of returns actually get audited (around 1% by one estimate), I held the same general opinion of the IRS. These guys were the baddies who wanted nothing more than to squeeze every dollar they could out of me and my family. As of this week, however, my opinion of them has changed. I got the dreaded letter this past week. In my mailbox was the business envelope with the return label “Internal Revenue Service” on it. I cringe a little in fear of what’s inside and, more importantly, how much it’s going to cost me. I open the letter and read the first line – “We are writing to you because there is an error on your 2009 Federal Income Tax Return.” This can’t be good. I have a degree in Finance and have worked in financial services for the past 14 years. I like to think I can fill out a pretty standard 1040 correctly but the piece of paper I’m holding suggests otherwise. The notice indicates that there are not one but two errors on my return. The news just keeps getting better. The first bullet point says that I should have computed my tax using the Schedule D Tax Worksheet instead of the standard tax tables. It goes on to say that the tax rates used on this schedule are generally lower than the standard rates. The IRS has recomputed my calculation and says that I am due a refund because of it. The clouds begin to lift. This is great and all but I haven’t gotten to the second mistake. Can’t get too excited yet. The second bullet point says that I was eligible to claim the Making Work Pay credit and failed to take it. They computed the credit for me and updated my tax return. Between the two errors, I am due a total refund of $816.60. If I agree with the changes made, there’s nothing further I need to do. I made two mistakes on my tax return (both of them in my favor) and the IRS contacts me voluntarily to tell me they want to send me money back? I am honestly surprised. The bad guys are being nice to me! And it gets better. Are you kidding me? They’re going to send me interest on the mistakes that I made? Sign me up! I can honestly say that I never expected this when I saw that letter arrive but now that I think back on it this isn’t the first time that something like this happened to me. Back in 2003, I split time between two different jobs (both well paying thankfully) and as a result I had too much withheld in Social Security tax between the two jobs. I was supposed to reclaim the overwithholding on my tax return but failed to do so. Once again, the IRS contacted me a few months later to notify me of the error and to tell me that they would be sending me a refund check. This experience has taught me a couple things. First, I need to be a little more diligent in filing my tax returns. Second, my opinion of the IRS was wrong. They’re not out to just turn the screws on taxpayers. If you’re not out to purposefully evade taxes, they’re not out to get you. They’re just trying to collect their fair share. The lesson I learned it that you very well may hear from the IRS about your tax return but it could be because they’re looking out for you. Looking out for you? They’re merely giving to you what is yours. Remember, we tax payers spend a lot of money on them. They work for us; not the other way around. They SHOULD be taking steps to correct the books, whether you made the mistake, or they did. Government of the people, for the people, and by the people. Glad to see you get a little extra money back! I can’t help but agree with you here. As you said, the IRS has a very bad reputation, but that reputation is also well deserved. They conform very strictly to the letter of the tax code. And in many cases this means they will come after someone and fine them plus add interest, among other things. But it also means that people can get positive things from it, as you have. Of course even with that happening the IRS will perpetually have a black cloud hanging over them. People don’t like paying taxes even if they agree with them. And one of our favorite past times is to complain about something. I suppose if the IRS and Canada’s Revenue Agency prefer to employ the honor system and trust us to report honestly, then they should, in turn use the same honor. It is as you say, refreshing to know that they exist for the pursuit of accuracy. Whether we’ve made a mistake in our favor or not. Actually, they’re not. When you write a check to pay your taxes, it is made out to the “US Treasury”. The IRS doesn’t see a dime. 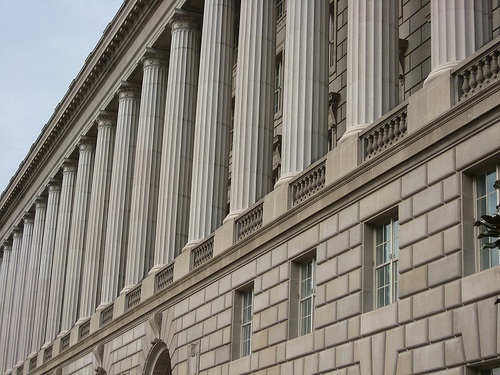 The IRS enforces laws written by Congress. If you’ve ever read the tax code, you can understand how difficult the IRS actually has it. They have to turn that crap to English.